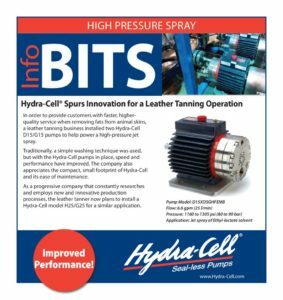 In order to provide customers with faster, higherquality service when removing fats from animal skins, a leather tanning business installed two Hydra-Cell D15/G15 pumps to help power a high pressure jet spray. Traditionally, a simple washing technique was used, but with the Hydra-Cell pumps in place, speed and performance have improved. The company also appreciates the compact, small footprint of Hydra-Cell and its ease of maintenance. As a progressive company that constantly researches and employs new and innovative production processes, the leather tanner now plans to install a Hydra-Cell model H25/G25 for a similar application.